It is hard to believe that we are on Block 11 already. This year has flown by. I guess it is true what they say….the older you get, the faster time flies. I think one of the reasons this year has flown by so fast is that we have had more than a few weddings in our immediate family (2 daughters, 1 niece and 2 nephews). Next week our entire family is off to Cuba for the fifth(!) wedding. Looking forward to relaxing in the sunshine. Block 11 of “Hugs and Kisses” is an easy block. In fact, all of the blocks in this quilt are easy. Nice for a beginner:) If you are doing the Block of the Month with me, this is what your block will look like. I am making my version in browns and pinks. Only one more block to go! I spent the last year making my 2 granddaughters their I Spy quilts. The pattern is called Smitten by Lucy Carson Kingswell. Shopping for the fabrics was an absolute delight! It gave me a chance to visit every quit shop in the area. I pieced the blocks by hand, and I used acrylic templates to cut out each piece. Loved the process! I quilted both quilts by hand…again, loved the process. I am pleased as punch at how lovely the quilts turned out. And, these are the labels. Thanks to Christie Davidson for doing such an awesome job on the labels. What a perfect touch! Last month I had the pleasure of presenting a Trunk Show at the East Lake Simcoe Quilt Guild, located in Beaverton, Ontario. I received such a warm welcome. I am always happy to travel to guilds and show everyone that there really is a stress-free way to do hand-applique! 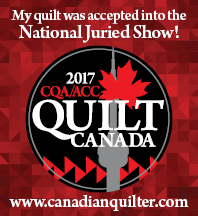 Last week I traveled to Newmarket, Ontario, to visit the Moraine Quilt Guild. Such an enthusiastic, welcoming group of quilters. So, my husband and I decided to do a bit of remodeling around our house. One of the major jobs we have wanted to do for a long time is to replace the carpet in our family room downstairs with hardwood flooring. Well, that is all well and good, but over the past couple of years, I have slowly (and nonchalantly) taken over the entire family room for my quilting/fabric hoarding. So, for the past week, I have been packing up all my “quilting stuff” and it is now in storage. Yikes! I did keep out a few projects that I need to be working on, class samples etc. Oddly enough, I came across a few projects that I have started and have not completed (imagine that!). But the problem is, I cannot for the life of me remember why I didn’t finish those projects. There are one or two that are very close to a finish. So I am going to go an a bit of a finishing spree. Wish me luck!